Winnie the Pooh has been a part of many people’s childhoods, myself included, since A. A. Milne published the first story almost 100 years ago, and its enduring quality comes from the well crafted characters and environment that have stood the test of time. That they came from the imagination of A. 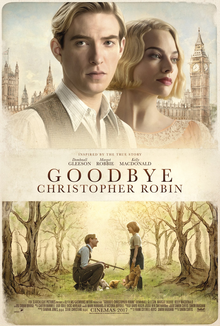 A. Milne’s son Billy, the real Christopher Robin, is the story of ‘Goodbye Christopher Robin’, and it sets out to tell the story of how the books came into being and how they affected the lives of Milne and his son. The story begins with A. A. Milne and it attempts to get us into his headspace with some flashbacks to his time fighting during the First World War, which serve to give some grounding as to why he takes his family away from London into the countryside, but they never really fit into the film seamlessly. Milne is played by Domhnall Gleeson, who is fast becoming every bit as reliable as his father, and the film is at its strongest when it starts to explore the relationship he has with his son (Will Tilston). The moments with them playing in the woods both work as a view into the happiest moments of their lives, and as a view into the imagination and creativity that led to Winnie the Pooh and the 1000 Acre Wood coming into being, and I really enjoyed the film at this point. It also excels when the focus switches after the books become popular on to the effect of fame on the family, and Christopher Robin in particular, showing that success does not always lead to happiness. The film also features a good Kelly Macdonald performance as the family nanny, and Margot Robbie as Milne’s uncaring wife, but the stars of the show are Gleeson and young Will Tilston, who is a real delight. This isn’t a film that’s going to win any awards, but as an insight into the story behind one of the best loved children’s books of all time, I thought it was a very enjoyable watch.